Have you tried the new Maze Grill Cafe Menu at NBC Sports Club? 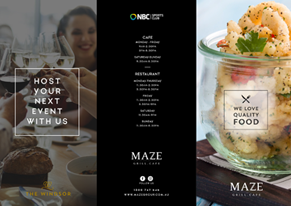 With lunch specials and nightly specials from just $12, plus a full a la carte menu to choose from, Maze Grill Cafe really provides a wonderfully relaxed dining experience for members and guests. Their team of chefs and management create seasonal menus that are prepared fresh daily to satisfy your tastebuds. With delicious daily and seasonal specials there is always a reason to come back and try something new! With different dining areas, whether it be the dining room, outside deck overlooking the bowling greens or a comfy seat near the fire place, you can always have a different experience at Maze! Maze Grill. Cafe is open for lunch and dinner 7 days.